When promoting practically any kind of event nowadays, live tweeting can basically be considered a necessity. Whether it’s a concert, conference, convention, or nearly anything else, keeping people posted on up-to-the-minute action is important. For unless you happen to have your own TV channel, there really is no better way to keep fans updated on what’s happening when an event they’re interested in is taking place and they can’t actually be there themselves. Live tweeting is simply what it sounds like, and that is tweeting live from an event as it unfolds. Whether it’s a press conference or a rock concert, the point is to make people feel ‘almost’ like they’re actually there, so you want to tweet the highlights periodically throughout the event. Therefore, you must use your better judgment to decide what is and isn’t tweet worthy. Additionally, it also involves sharing what people are saying at an event as it takes place, and live tweeting also requires being focused on the event hashtag, which you should always have setup in advance. Although it might seem like the same thing as regular tweeting, it’s really quite different from typical, everyday tweeting. This is because you have to truly experience the event while paying attention to tactical tweeting at the same time. There are several reasons why tweeting live from an event is important. For starters, it’s an easy yet effective promotional strategy that doesn’t cost much, and that’s only if you do decide to create a paid campaign in Twitter. Otherwise, a tweet is always free! Furthermore, since the point is to provide someone with a sense of being there when they can’t be, Live-tweeting events is a great way not only to gain new followers, but also to get people to visit your website. So, anything that you tweet during this time has the potential to attract attention and make an impact. In addition, it can help establish your reputation as an expert on events. Just as a blog or other pertinent promotional info is important, so is live tweeting, because it really is micro marketing. As selling is the bottom line, getting the word out in this way can be beneficial to your business. For more information on using Twitter for ticket sales, see this recent blog post of ours. Whenever something worth mentioning occurs at the event, you whip out your wireless device such as a smartphone or tablet and start sending out the news. Perhaps start with a note/alert a few minutes before it begins and then continue delivering the content at regular intervals for the duration until the final tweet at the end of the event. Monitor other attendees who are also tweeting and retweet, favorite and reply to tweets and direct messages. Use other services such as Vine and Periscope for sharing video from a live event. Also, depending upon the extent of your involvement in the event, you may be able to get pre-access to the press kit. The information in this kit can help you plan tweets that complement the event, such as relevant quotes, links to books, videos, movies or even images that are branded with your company logo. Properly preparing tweets ahead of time before the event helps you build your reputation with both attendees and non-attendees, especially those who are using the event hashtag. Next, create a Google alert to see if any articles have been written about your company. If you do find one, live-tweet a link to the article along with the event hashtag. Don’t forget to also share the article on other social networks to increase your amount of exposure. In addition, make sure you note the Twitter handles involved before the event and watch out for their tweets. Maybe create a private Twitter list so you can track their tweets more easily, and remember to retweet them when it’s relevant. In order to do this, your Twitter profile must resonate with event attendees who are also tracking the event hashtag. There are several ways in which you can live-tweet other info about your services without actually spamming the event hashtag. Whether you’re a ticket seller or event manager, this method is actually used by many, as it’s an opportunity to slip in some friendly advertisement. Use live-tweeting to inspire interest or make an important announcement during an event. However, make sure you’re not spamming the event hashtag, which could have negative repercussions. Perhaps announce some exciting news about your company while at the event, such as an upcoming promotion or new show. Before the event, find out if any journalists or bloggers will be attending. You can often even get a list of these people from the event organiser. Request this list at least a few days before the event. If you’re announcing important news or promoting ticket sales at the event, let it be known. Plus, let the newsies know that you’re available for questions throughout the event. One way to create relationships with influencers is to live-tweet their presentations or performances. Make sure you’ve copied the correct Twitter handle for the talent and then start tweeting important pieces from the performance. This provides much appreciated content for not only the people at the event, but also for interested parties who weren’t able to attend. Hopefully this bit of information has been helpful and that you better understand the power live tweeting can have. 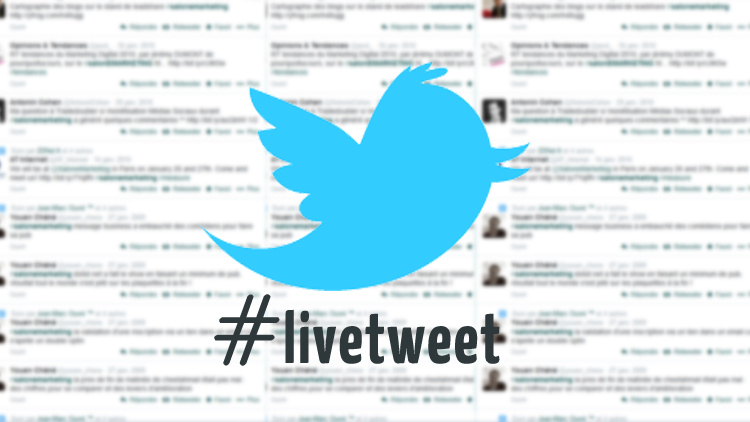 In fact, you don’t have to physically attend an event to make an impact with live tweets. If you’re unable to attend, you can still actively participate by interacting with other tweets coming from the event by retweeting and using the favorite button. If you’re lucky, the event may even be streamed live over the Internet in real-time, so you can follow it as if you were really there. This is a great alternative if you don’t have the budget or time to travel to the event. Now that you’re up to speed on promoting events with live tweets, it’s time to test-drive your new skill at the next one. Remember, you don’t have to tweet every 2 minutes, but try to keep the quality content coming at a steady pace. When done right, live tweeting from events is an effective way to convey up-to-the-minute information. So remember, if you go to events with a live tweeting strategy already prepared, then you know it’s highly likely that you’ll increase engagement with your target audience and hopefully even make some beneficial business connections! Plus, for more useful tools and tips regarding ticket sales and events, please visit ticketbooth.com.au!